This high efficiency barrier filter is specifically designed for gas turbine air intake applications. 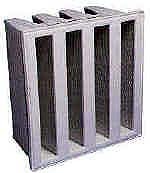 The filter provides high volumetric air flow with extremely low pressure drop. TriCel all-plastic frame can be completely disposed of by incineration. Each unit ships with new gaskets pre-mounted to the air leaving face of the header. The filters fit most commonly used filter frames, utilizing existing latching mechanisms. They are also available in a plastic/galvanized metal frame model.